Well it looks like the 'oops' on the date was noted and the original has been amended. Bonjour mon frère, voila exactement ce que j'ai envoyé à la direction Générale pour signature, mais il s'est avéré que Monsieur Pape Ciré CISSE l'a fait changer par son assistante je ne sais vraiment pourquoi. Mais pour Robert BAINES c'est moi qui ai fait cette erreur grotesque , toutes mes excuses pour ce désagrément, je vous demande juste de le rectifier à la main SVP. So I am a licencee now for 6W. Updated here http://m1kta-qrp.blogspot.co.uk/2012/08/ft817-more-investigation.html follow the FT817 tag. Still looking to see if I can fix the rig (6am this morning before had to go to work) and it seems to just be the choke that shows signs of damage but I will not apply power to the rig yet. The only reason why seems to be the PSU supply BLACK terminal was grounded through the rig RF connection as I had the oscilloscope RF sniffer in line. This meant that the rig ground was connected to the real ground, the rig power lead was (as I found out) floating above ground when normally connected to this supply and one thing lead onto another and phut! I had run the same setup with a new laptop for CAT control but the USB was directly connected to the laptop, same with an audio interface. That the laptop had not had an external connection to power might explain why I never saw a problem. My FT897 is still fine as that was connected to a MyDEL PSU at the time and I tested that and a few other PSU, everyone has the chassis connected to ground connected to the black terminal. I expect it was the XM19V PSU (same one involved when a laptop USB rail was killed a few years back when messing with digital interfaces!) For 6W and C5 this might mean I might opt for an SDR option and take an SDR RXTX and a small PA. It does appear I can remake the choke as I have the original housing and ferrite and the winding is not going to be impossible to replace. Fiddly but not impossible. An on air comment was made that the audio of the station was clipping or distorted. Not ideal (waiting for the rain to stop before I dash inside)... but I had my PC create two tones one at 700Hz the other at 1900Hz pretty much as a two tone generator might. I could feed this directly into the rear of the rig through the data socket but in this case I'll just key the mic so the radio picks it up and using my little RF sniffer/sampler/demodulation/detector rig I can view the SSB signal on the oscilloscope. Video below. This is with my FT897 and I started at 5w and wound it up to 100W just to be sure. All into a dummy load as I am sure live on air two tone test not a wise idea. I'll do a proper test shortly but even though the results are not conclusive I am reasonably satisfied there isn't a problem with the rig. I suspect it was more a case of someone being off frequency or using a beam in the wrong direction. The videos of the tests. (The ipod recorded them sideways sorry !) below. The eagle eyed will realise the rf sniffer is on the left and demod is on the right. The RF pass through I use is a length of solid earth wire from typical household ring main cable. The circuit was not hard to build, it is just 4 BNC in a line on a strip of PCB. RF pass through between middle two, and the RF snif, I use a resistor divider to allow be to snif the RF 'live' is on one end and a simple diode demodulator on the other. I can feed either or both into the oscilloscope. The proper one I have is in a nice long dicast box along with an antenna current output too. My CW signal was not commented on but this is what it looks like from the rig. I always operate from home especially during contests with a 7 pole low pass filter with about 80dB rejection above 30MHz as neighbours have commented that they can sometimes hear the signals through their FM radios... not for last two years now though. This link has a lot of interesting info. The demodulator is as I say in the video a simple dual diode IN34 detector. The RF sampler is a resistor divider chain. It could be a torroid transformer around the RF line, which is simply a bit of wire connecting the RF In to RF OUT. I have the two signals going into two channels not going in as X and Y as he used for the trapezoidal test. You adjust the timebase until such times as you can 'see' the signal. Right in middle of RSGB IOTA contest, well about 4am this morning. I thought I'd switch to my FT817 and new laptop. Switched on and everything seemed to be fine, was not keying anything at the time and just listening.... then buzz... psskt and the FT817 goes dead. Immediately switch off the DC/mains feeds to anything radio in the shack. That definitely recognisable magic smoke smell. emanating from FT817. Quick check and nothing else effected, laptop USB ports all fine and did a visual check on the sockets etc. When cool (it was warm) I opened to discover that a choke near the DC input has some turns that are definitely melted! Rubbish photos right now but only got a crummy camera with me. It is the bifilar wound choke just to one side of the L3 inductor. I have the RF from the active rig going through an RF sample. So that I can feed into an oscilloscope to check what the signal looks like and isn't clipping etc... that is fine. Been told that the inductor in question is T1035. I might check that TP1077, TP1078 and TP1083 are not showing a short to ground with the choke not here. Some more digging. The PSU I am using for the FT817 is a Maplin XM19V. I see 13.8V on the output between the black and red terminals but between the chassis gnd and the black terminal I see 24V (23.62V) eek! What is that there for? 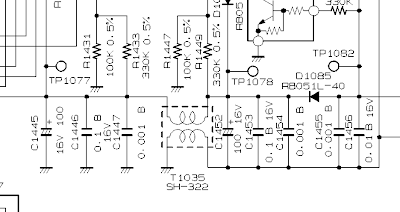 Anyone got a circuit diagram of that PSU? Doing some investigation of the shack DC stuff. Recent GQRP posts were talking about mixers at HF and it made me remember I had a transverter project for 1.2GHz on the back burner. In the mad first year of being a licencee I bought a number of things I either used once and put to one side or never got around to using as the QTH didn't suit. One group of things were a couple Comtech RX and TX setups for 13cm and 23cm ATV. Including a pa module for both and a controller (G6ALU). Anyway other than a very brief play did nothing with them since and they were stored in a nice plastic box in the shack, with a couple of de-humidity bags. In 2005 I was at the mic of the CDARC 'B' station, never was allowed to operate in the 'A' station tent, during VHF field day and we had a brief play on 1296MHz SSB with an FT290 (mine) and a home brew transverter. Anyway I remembered the occasion and always thought it would be fun to put one together. Looks like I'll have a couple LO options...using the Si570 I have (it is the version that will go to 1.4GHz), a G4DDK LO at 1152MHz, a completely homebrew thing that I am trying to get to 1256MHz (so I can use 28MHz) a couple RX side 1.2GHz RX amplifiers and a Mitsubishi brick 18W PA. Anyway as I get further along I'll post details. The antenna will be a yagi using 6mm Ali tube for the elements and a square section for the boom. I will probably clone the DL(>forget rest of call right now) design and it will be about 5 foot long. I have enough Ali to even stack two of them... I also have a 30 foot length of LDF450 and connectors to N-TYPE I can use to feed it. I have a small dual port directional coupler (and bits in a bag) that I think I was intending to make into a strip line VSWR meter for 1.2GHz with some 50uA meters. I must figure out where I can get some RG316 and some SMA connectors, and work out how to make them up. I must be mad as will attempt data modes when in C5 and 6W so I write this as a few have asked what my working practice will be so How to work me in C5 or 6W: RTTY and PSK If I am on either mode I will usually be active first thing in the mornings (that is local time in Senegal (6W) or The Gambia (C5)).I will almost always start by beaconing for some time on the frequency I will use.Please note I have said I have volunteered to help rookie ops from US obtain a qso using these modes with a new DXCC and I will be in the ARRL Rookie Roundup(19th August) and the SARTG WW (18th and 19th August). If you can hear someone is having difficulty making a contact please let them try before swamping them, most will be new ops and at or near qrp power levels.I will be using RTTY and PSK as conditions and activity allow, I will certainly will be making efforts to give everyone who wants a QSO the chance to work me. I'll not explain how to use either data mode or how to set up your transceiver to use them there are loads of references out there that will do that far better than I can.As I have been asked I use DM780 software from Simon HB9DRV. I use a modified usb external sound blaster sound card. FT897 or FT817 in digital mode with a 500Hz filter fitted. I use http://www.xggcomms.com/ rig to PC interfaces. (Interface from G4ZLP for cw keying with Winkeyer USB from www.k1el.com)If you have never used either data mode then, my trip is mid to end August so you have a couple weeks, when you are set up try listening to the frequencies for these modes the easiest is to start on 20m and listen for RTTY around 14085. RTTY is a bit like two triangles being run constantly, with a clear difference between the two tones. PSK will be found nearer 14070, and is almost a steady warbling. A PC “Waterfall” display will show anything from none, a few or a lot of stations. There are loads of modes displayed http://wiki.ham-radio-deluxe.com/index.php?title=DigitalSignals I will be on BPSK31 (narrow band width 31Hz) and RTTY 45.45 Baud with 170 Hz shift.To find me, look for M1KTA in the waterfall as I have asked to use my home call with a suffix or prefix in both DXCC.I will be either operating qrp or damned close to being QRP so do not expect me to be the loudest signal, if there is a really load signal that is probably someone down the road from you (figuratively speaking).Try and see what stations I am working, I will not be transmitting on the same frequency. Then you can try transmitting – if you are running a rig in USB mode first turn the speech processor off if you do not have a rig with a dedicated data mode option! Then click the “TX” icon and away you go – but be careful – you must limit the power output of your transmitter to about 35% of the PEP power rating – so for a 100 w pep transmitter use no more than 35 watts RF out on either of these modes. You can adjust this using the Mic gain control.A little practice will result in easy QSOs on these modes, but you need to get that practice in before trying to work a DX station – as there is more to learn! I will be working split – this means that you will need to transmit above my frequency but you should see both my tx signal and the stations I have just worked (hopefully will be you too) 1-3KHz above. For both PSK and RTTY 1-3 kHz is probably the best choice, I do not expect any pile ups but there might be the odd 'queue', if there is I will use the split facility and say so some software allows you to select a different transmit frequency simply by instructing the sound card to “split” or lock to it. The ONLY EXCEPTION is if anyone wants to try JT65 on 2m EME during moon rise 15th to 22nd August that I have not already been in touch with. Please note I will not remotely be interested in your rig, antenna, kids school, sound card, dogs name etc and so many things that are included in psk or rtty contacts... your callsign and exchange, that is it please do not send me anything else. I will log through LoTW and direct cards through buro when I get home. If you have alternative qsl card info or do not want a card tell me otherwise send nothing. My licence for 6W has arrived, it covers the wrong period. 15th November to 5th December. There was a mix up with another op he got my licence period hihi. It will be sorted out. In prep for the 6W/C5 trip I splashed out and bought myself a Z11ProII ATU from LDG from a vendor down the road from mum and dad in Cornwall. 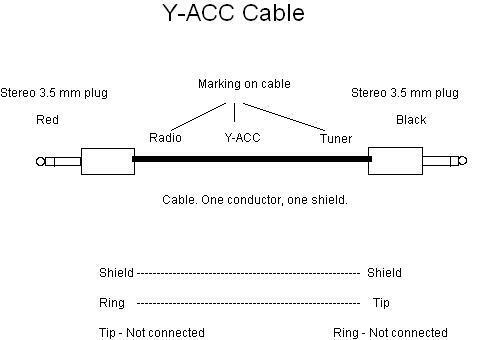 I didn't splash out on the Y-ACC cable though to use with my FT897... why because for pennies you can make one yourself.... LDG even tell you how. Take a 12" or so length of twin core (I use a piece of red/black 6amp cable hacked off an old rig power feed) and two 3.5mm stereo plugs. I wrapped one barrel with red tape that will be the rig end that plugs into the ACC socket of the FT897 (looking at rear this is to the left of the RED socket which is the cw jack and to the right of the data (6 pin) socket. The other end I left as black that goes into the only 3.5mm socket on the rear of the Z11ProII just to left of power. The red wire from the barrel of the black plug (ATU) to the barrel of the red plug end (Radio). The black wire from the tip of the black plug (ATU) to the ring of the red plug end (Radio). Now when you want to to use the radio and atu but want to switch bands/frequency then just press the tun button on the ATU, it keys the rig for 1 second or so allowing the ATU to switch frequency and retune. It works best if you have already tuned the rig/antenna at that frequency in advance. I posted a question to FT817 yahoo group did anyone know how to get both sides of the audio form SSB QSO (I mean RX and TX not both side bands). I have some DX trips and I know that a record of the audio will be of interest. I tried a few options but it is just not (easily) possible to capture TX SSB audio from the rig directly so the idea is that I will use a small external box that M5CHH built with me a while back for RSGB IOTA contest which is a voice keyer, you plug a mic into it (RJ45), and a cheap Technika USB key sized MP3 player to it (could be any ipod input really). It has the option of feeding the MP3 player output or the mic input into the rig, nothing prevents you from splitting the audio that is used, feed one side back to a CAT5/RJ45 terminated cable that will feed mic input to the rig as per usual. The other side amplify (random op amp I used a NE5534 which was OK at 5V) and feed to a 3.5mm socket that can be plugged into a PC and recorded. At the same time I'll feed the RX audio into the box, from a Y audio splitter and this to the same 3.5mm socket. I will switch between them, probably just by relay and use the PTT line so you record RX or TX not both at same time (but I could add that option). I built it ugly style on the bench and it works so I'll bodge the current keyer with the extra bits. The box power comes from 5V from the pin 3 MIC power line. I could add a 12V feed so use the rig PSU add an LM7805 and couple caps to obtain a 5V regulated feed too. 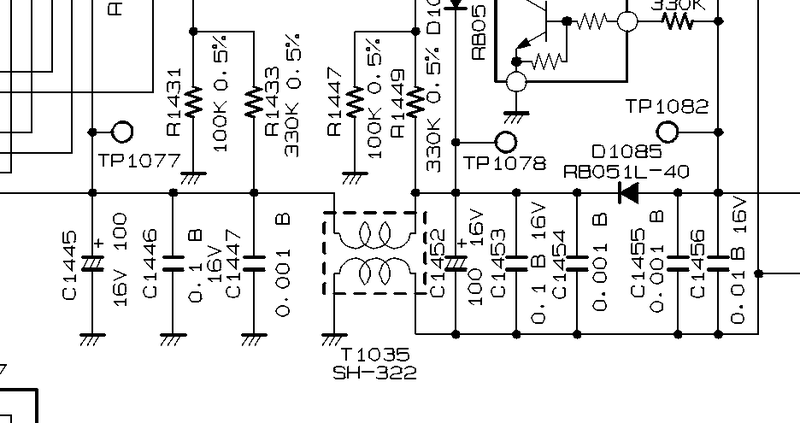 The MP3 player needs 1.2V and I used a bare LM317 connect in to 12V or 5V, adj and out and you get 1.2V out. I'll write up with images and circuits on this blog soon. An Audio TX monitor option for the FT897 or FT817 would be a nice add on. Confirmations have come through so I'll be QRV in 2 DXCC West Africa, Senegal 15th - 22nd August and Gambia 22nd - 29th August this Summer. Will be QRV SSB, PSK and CW (in that order) on most HF bands. 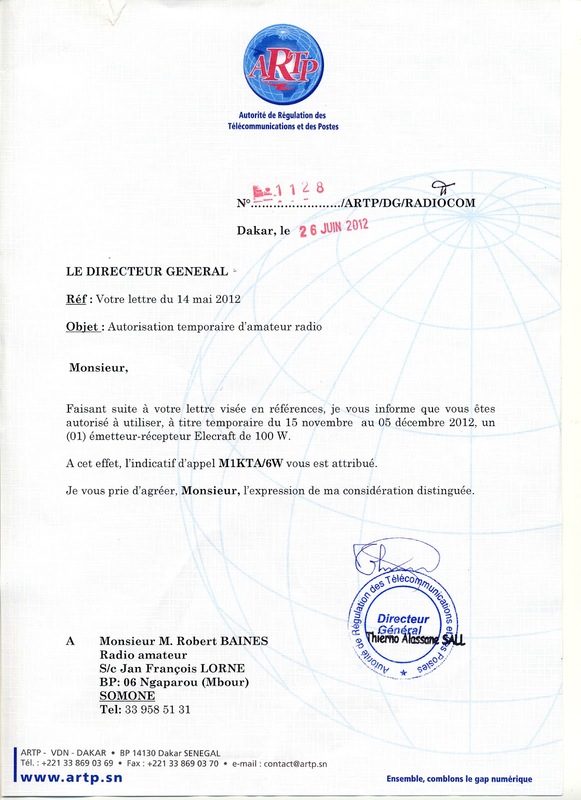 I'll also try 6m if open from Senegal. Note I'll have LoTW uploads active and will not qso stations which are obvious dupes. I'll post further plans close to trip. LoTW from the get go and throughout his operations. I will have a QRSS beacon or two with me as well so QRSS fans please look for me on 30m and other bands. More details to follow. 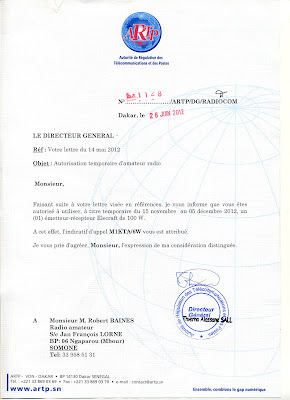 I have been asked a lot for details about how to get the licences for these DXCC and other logistics. I will post the details here, or you might find the trip written up in SPRAT, RadCom or CDXC digest?